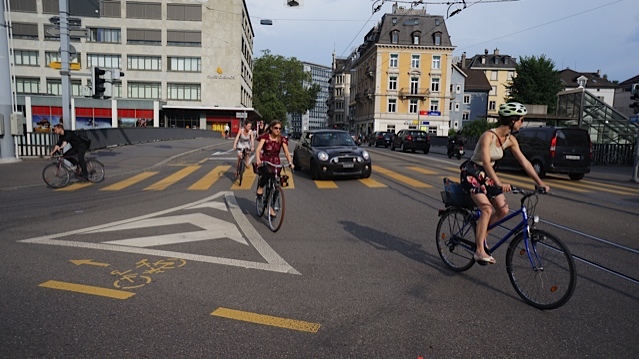 I just wanted to collate a post on bicycling in Zurich because the Streetfilm I'm producing from there will likely not be ready until end of Summer. 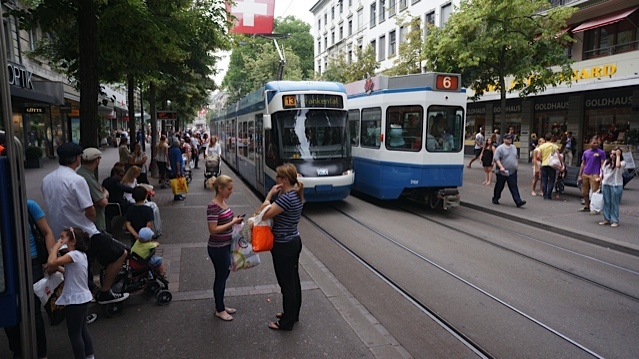 In that film you'll see much about why Zurich is such a wonderful place that has policies that keeps car use to a minimum in the center of the city and boasts one of the highest rates of transit ridership in the world. 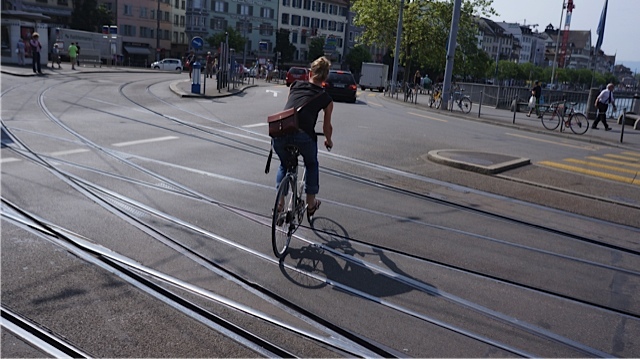 Zurich boasts a 6% bike mode share which would be super-impressive anywhere in the U.S. But to them it's not nearly good enough as they are looking to double that. The big problem is like many cities they have many narrow streets in the city center. 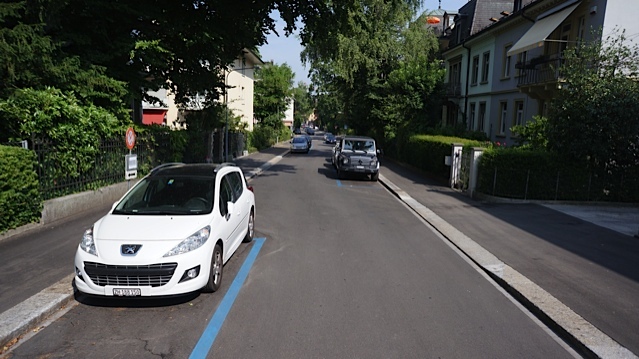 Except for along their wonderful lake, Zurich doesn't have many bike lanes - protected or otherwise. Most of the routes are signed and/or have painted ground stencils. But once you leave the busiest parts of the city some really unique treatments start to unfold. I took a tram ride to some residential neighborhoods and jumped off when I started seeing scores of 30 km (20 mph) speed zones. 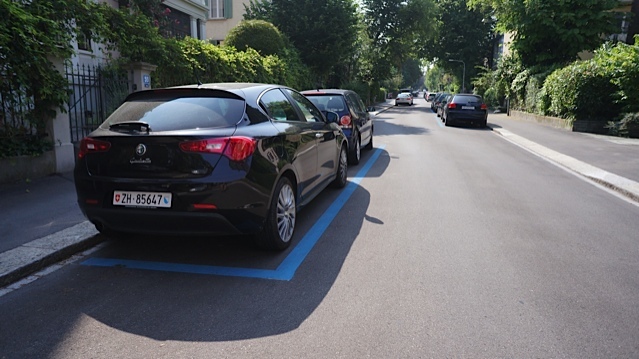 Like this spot which featured a contraflow bike lane and a 30km speed restriction. 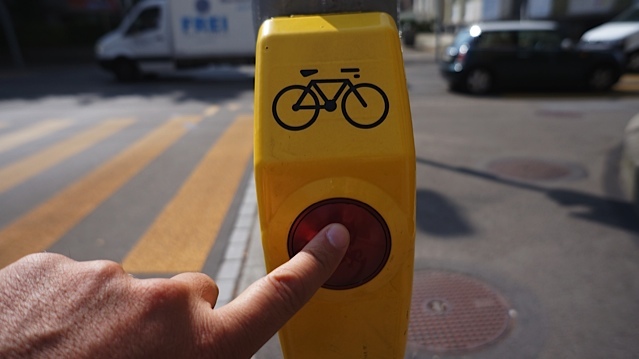 It also had a button to activate the stoplight to facilitate speedier crossing for cyclists. 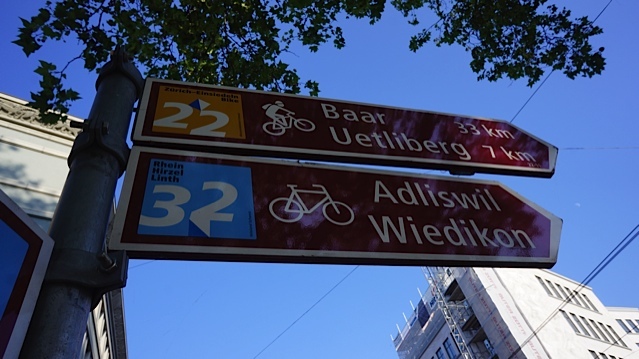 And of course even though there are no bike facilities on those streets, it makes the speeds slower. It's like being on a bike boulevard. Bicycling in Zurich is pleasant enough. But one of the marvels is watching cyclists in a place which is so incredibly dominated by trams and transit. That means many streets with rail tracks. There are six major hubs where trams come together and just create a world of rail spaghetti. Just watching bikers confidently navigate them with aplomb was incredible. In my three days there I saw nothing bad happen. We'll have more video of this in the coming Streetfilm. And we'll end with this, one of my favorite photos of my trip. I watched from across the street as this gentleman rode up to this woman and (I believe) asked for a bite of whatever she was eating. They were laughing and sharing conversation for a few minutes via this chance encounter. Just something that happens by bike in a city where livable streets are a priority. Posted in Bicycles, Streetfilms News. 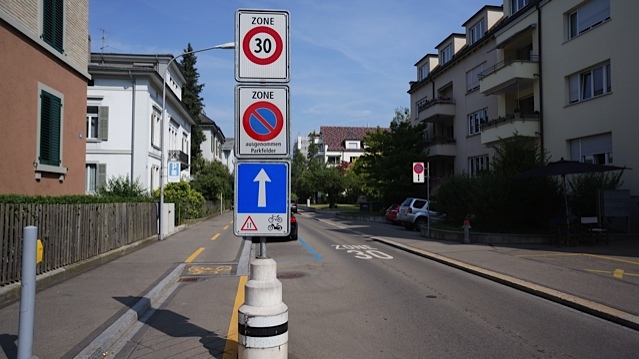 Tagged as 30km zone, Bicycling, Chicane, contra-flow lane, Transit, Zurich. While I agree that the chicane technique is cool, I certainly wouldn't call it 'unique' as you did on Twitter. I've seen it deployed throughout western Europe for the past 20 years. I can find two dozen streets that use it within walking distance of where I live. Well in the U.S. we don't have very many. Are these car parking spots making the chicanes or are they physical curbs/planters/road design? 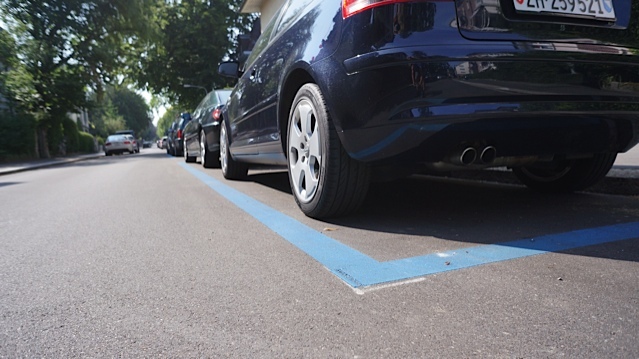 I am pointing out the uniqueness in just using the positioning of the car parking spaces. Goes to show how a little bit of intelligence in designing a street can make a whole lot of difference without costing much. All is needed is a bit of wit and courage. Mr. David Hembrow says such designs as the one above are relatively frequent in the Netherlands (sigh). It is really intelligent to do it this way, because when you are running a city, there's never enough money; this is quite cheap to do.